What a party town Madrid is! I have never seen so many bars and restaurants open so late. (And yet the city is moderately tidy). 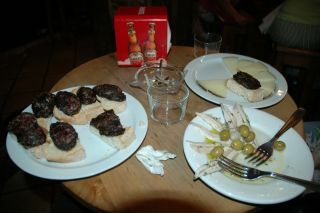 To the left is our first set of tapas: anchovies in oil, Manchego, chips with blue cheese (not yet arrived), and blood puddings. I had forgotten how large the portions are in Spain. Patricia was even denied one course at a restaurant with the words "No, it is too huge." Patricia booked this weekend à deux for our fifteenth anniversary. 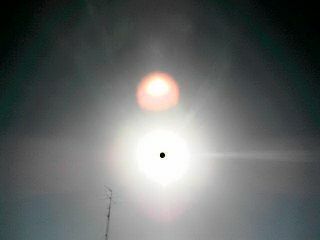 We had never been to Madrid, plus there was an annular solar eclipse on the Monday. I am afraid that I ragged her about the annular part, which meant no totality and no terrifying wall of shadow moving at incredible speeds. But in the event it was rather cool anyway. We stayed at the Hotel Emperador, which is supposedly four-stars, and we paid about £130/night, but our room was small, dark and smelly. This was too bad, because as we accustomed ourselves to going out for dinner at 10 or 11 pm, we really needed somewhere nice to nap in the afternoon. Oh, also because I tended to drink a lot at lunch. On the left there you see P eating chorizo and drinking fresh-squeezed OJ at our fave lunch (breakfast) spot, Museo del Jamon. Like many of the other customers, I was drinking beer, and sampled the sangria as well. 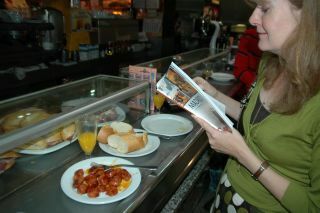 Only two euro for the chorizo plate. I was afraid that the Prado would be as big as the Louvre, but instead it is just the right size for a few hours. We made a bee-line for the Bosch. 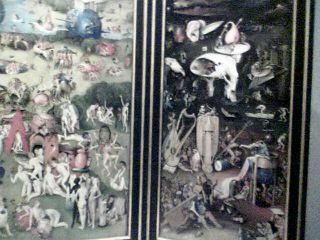 It was great to see the Garden of Delights (or "that strawberry painting" as father Siguenza called it). Also, I had never seen The Hay Wain before. Our other favorite room was the one full of Titian nudes. It even has a pink bordello-like wallpaper. We hung out here texting the kids. We liked Velazquez, did not much care for Goya. On Sunday we visited the Thyssen-Bornemisza museum. 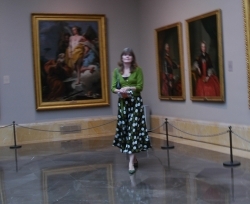 At the entrance there is a gratifyingly tacky painting of Mrs Thyssen (a former Miss Spain) in a dress with swan wings. But we should not carp, as the museum is well laid-out and labeled (with English!). One of my favorite paintings was a Van Gogh evening scene (reality much more impressive than the jpeg). Also liked the Moreau, been wanting to go to his museum in Paris. Chocolate and churros of an evening. We spent Sunday morning at the open-air markets in the Rastro. The only thing I liked was in an antique shop, a still-life painting measuring 202 by 337 cm. 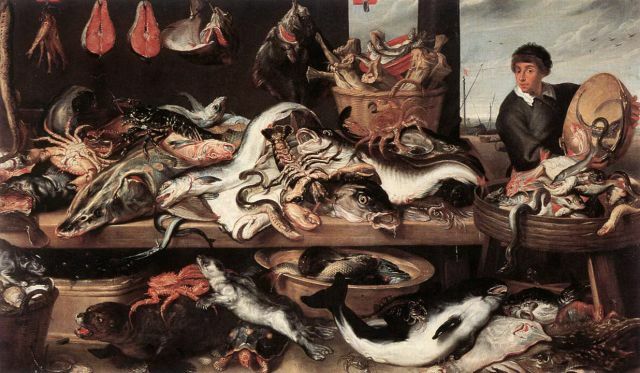 The owner said it was by Frans Snyders and asked €100,000 for it. It was similar to the one you see at the left, only mirror-reversed, and with a woman (or a girlier-looking guy) instead of a man. Same two pieces of salmon at the top, but a bigger turtle down below. I don't think there is a wall large enough for it in our house (maybe the staircase), even if I trusted the provenance. As I left I was approached by a Mister Big, all in black, who said he had more nice paintings at his home, if I wanted to see. I had to decline. Nice to dream, though. Monday was the big solar event. The hotel rooftop was full, mostly with Britons (one of whom calmed my fears about the sun damaging my CCD, as he had called the Nikon help line). It did get noticeably dim and cool, but you needed a dark filter to see what was really going on. Luckily another couple loaned us a spare (the hotel had run out, none for sale on the streets). Interestingly, my best photo (right) was with my phone, with the sunglasses over it. At the peak, the roof-arbor cast doughnut-spots of light in its shadow. I won't bore you with our trials with the lame-brains at Iberia, who had somehow cancelled our return reservation (made through BA, who also denied responsibility). My favorite comment from the Iberian check-in girl was a final "You did not fly here with Iberia." Luckily I had been using the boarding pass as a bookmark. Anyway, P's white-hot rage (with a flu, too) saw us through to two stand-by seats. I am glad I married her.